LONDON – Passion can be difficult to explain and harder to re-create, especially when the passion is for abstract art. But passionate acting and design just about make a success of John Logan’s new play, “Red,” that deals with supremely passionate abstract artist Mark Rothko. 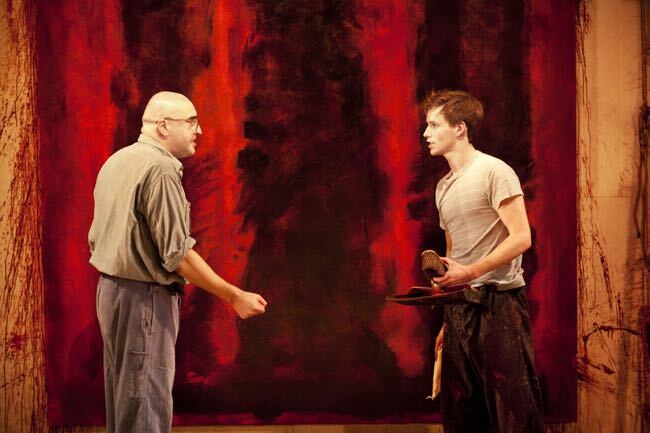 Set during the time when Rothko had been commissioned to deliver what were known as the Seagram Murals for the walls of the Four Seasons restaurant in Manhattan in the late 1950s, the play is a two-hander between the artist (Alfred Molina) and his new young assistant, Ken (Eddie Redmayne). Logan portrays Rothko as so passionate about his work that he’s not convinced anybody should actually ever see it. “Selling a picture is like sending a blind child into a room full of razor blades,” he says. Doggedly working class about his daily rituals, the painter demonstrates no interest in his new employee even though the lad tells him his parents were murdered and that he also is an artist. It sounds like something a great artist would say, but like much of Logan’s play, it’s trite and obvious once examined, and only the passion of Molina’s delivery makes it seem vital. That’s true throughout the production, however, as Molina stalks, stares and blusters in magnificent fashion. Redmayne has little to do early on but to absorb the sow’s ears the great man strives to turn into pearls of wisdom; later, he matches his co-star’s magnetism. Director Michael Grandage and set designer Christopher Oram combine to give flourish to the encounters, with the actors swinging and hanging great canvases. There’s a dynamic scene in which they stretch past each other with furious energy, brushing red paint onto a huge canvas and appearing bloodied and exhausted by the end. It is exhilarating, and so are the scenes when the worm turns and Ken finally speaks his mind about the artist and his affectations. More than the words, it’s the craft and passion of Molina and Redmayne that make you want to seek out the paintings that Rothko created. Venue: Donmar Warehouse, runs through Feb. 6; Cast: Alfred Molina, Eddie Redmayne; Playwright: John Logan[ Director: Michael Grandage; Set designer: Christopher Oram; Lighting designer: Neil Austin; Music/sound designer: Adam Cork. This entry was posted in Reviews, Theatre and tagged 'Red', Alfred Molina, Donmar Warehouse, Eddie Redmayne, John Logan, Mark Rothko, Michael Grandage. Bookmark the permalink.